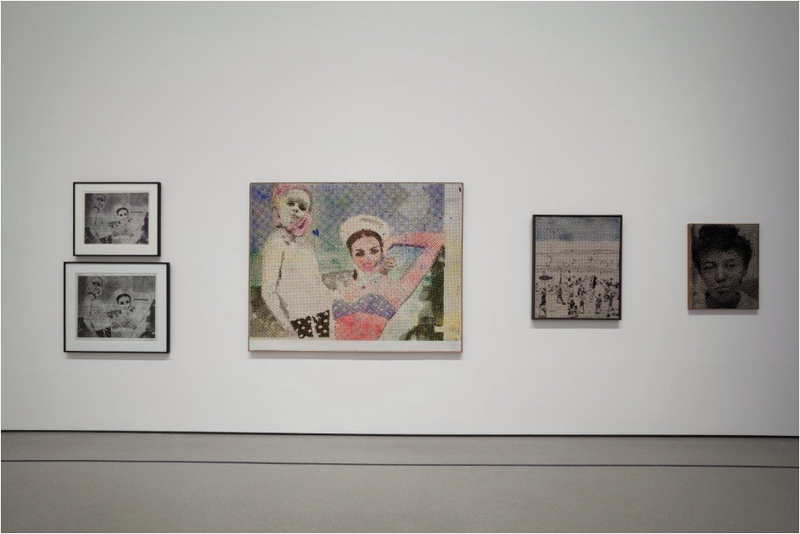 The most Pop-y of Polke’s works are those from the mid-1960s, such as the painting Girlfriends, 1965/1966 (above). 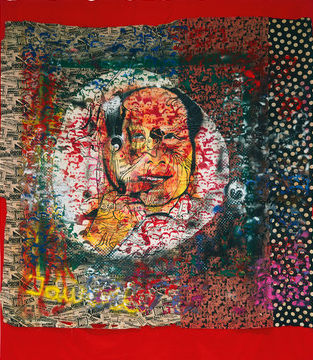 Taking an image from an advertisement, Polke mimics and caricaturizes the commercial printing process of using small ben day dots of color to create a picture. By hand, he enlarges and exaggerates these dots just enough to blur the image and reveal irregularities that occur in this mechanical process. Like the work of fellow German Gerhard Richter, his is an effort to expose the dissemination of mass culture as a halftone half-truth, an illusion constructed to make people want for an ideal or a lifestyle or a product as they entered a new modern, post-war, era. These ‘Polke-dots’ crop up in other paintings and prints the artist made in the 60s and 70s, becoming one of very few unifying themes of his artistic style. Another motif of Polke’s was the palm tree, his self-proclaimed doppelgänger. On view at MoMA are some of his palm tree works dating 1966-1971. The palm tree image shows up in various forms, such as the literal 2-D wall drawing of the tropical plant made from measuring sticks and tape (above right) or the more conceptual images of potential forms and states of the palm tree doppelgänger in his 14 prints and photographs (above left). Throughout the rest of his career, the palm tree appears in paintings and drawings, often combined with the grainy dots, standing in as a quixotic self-portrait of the artist. In the 1970s, Polke gets weird. Some of his videos, paintings, recordings, and collage works are a result of what happens, I presume, when you take psychedelics and watch the news. There are tapestries with newspaper clippings and cartoon characters affixed to kitschy fabrics and references to supermarkets and Mao and giant mushrooms (above) and recorded sounds and music playing that made me feel like a little woozy. 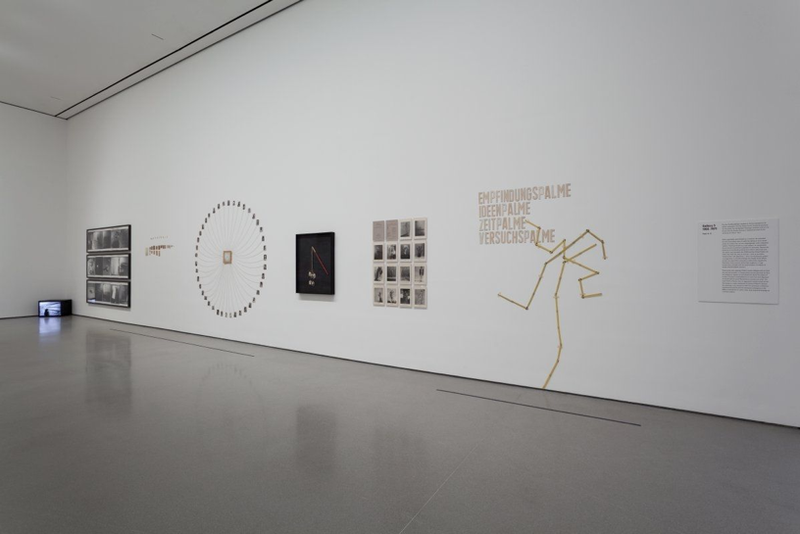 It’s an overload of puns and criticism of the ways in which serious political and current events are mediated through snippets, headlines, and fragments, or as he says “weak signals.” In the late-70s and early-80s Polke also experimented with making paintings with synthetic dyes and by burnishing the surface to achieve iridescent shades of gold, purple, green, and bronze that gleam under shifting light when the viewer moves about the gallery (below). Sometime in the 1980s paranoia sets is. 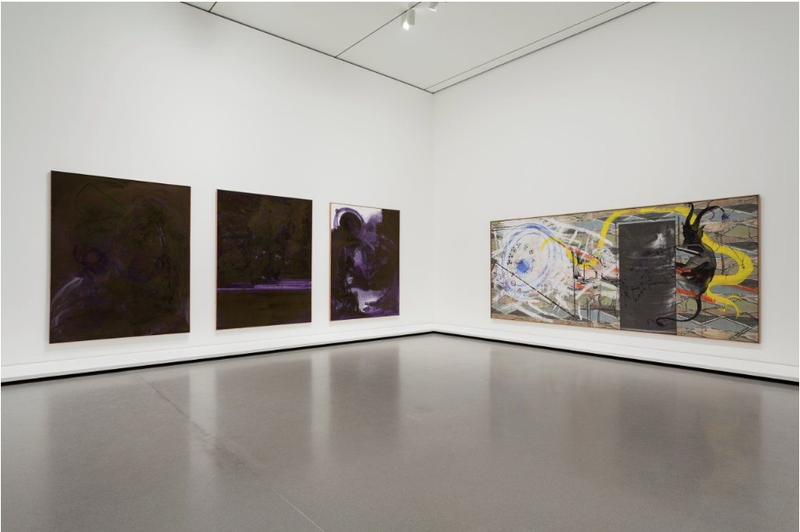 Polke’s works in this decade, like the Watchtower series of paintings covered in light sensitive compounds that darken over time so the image will ultimately disappear, are a reaction to events like Chernobyl and fall of Berlin Wall. 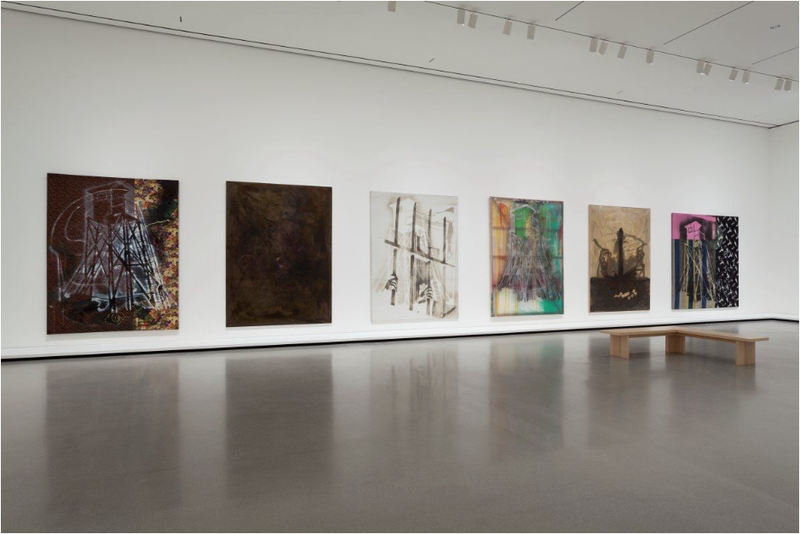 They evoke Polke’s unsettling memory of the nuclear disaster and the years of watchtower surveillance along the wall dividing East and West Germany. Like his other paintings made from synthetic dyes, the artist acts as alchemist on the surface to withhold from the viewer the entire image beneath. 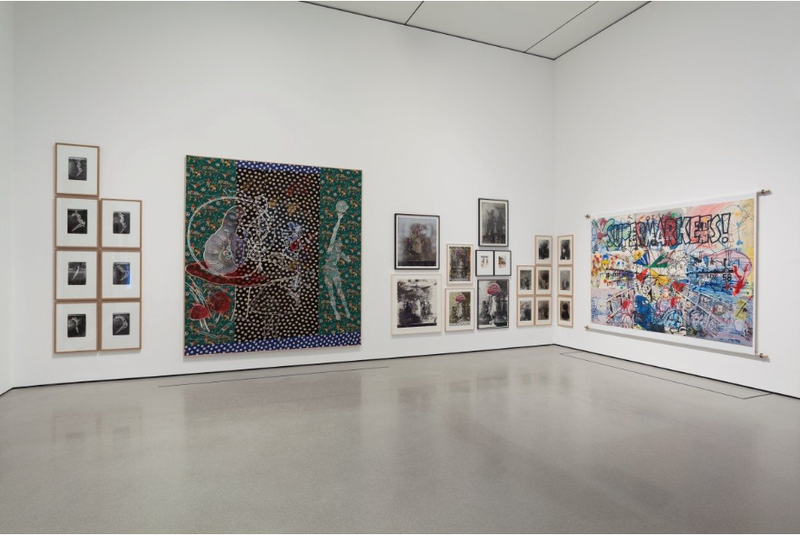 The greatness of Polke is we never get the complete picture. 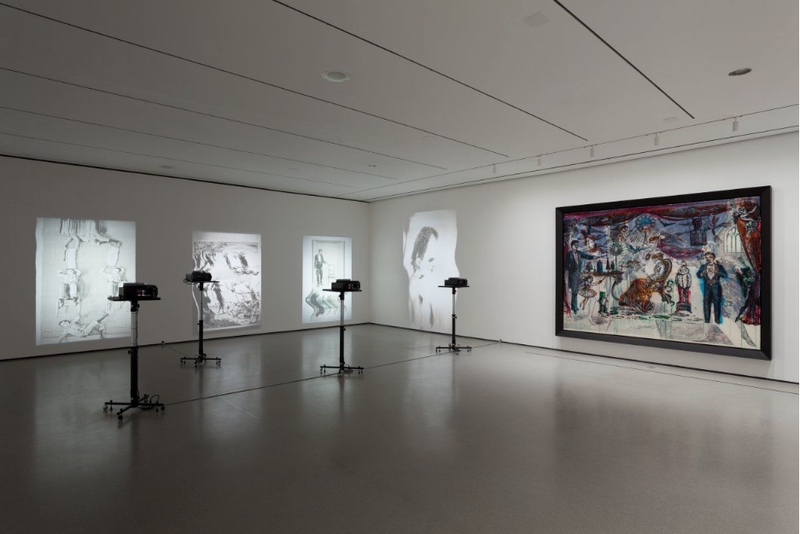 In the final two decades of his life and career, Polke tried his hand at artist-as-magician. For The Illusionist, 2007, (above) he covered the large image in a semi transparent material that acts like a hologram and animates the scene as you move. He also created slide shows of prints and drawings of acrobats and magicians that he blurred and altered by shifting them around on the xerox copier. Polke’s final work would be a 2006 commission for a stained glass window (below) for the Grossmünster church in Zurich. 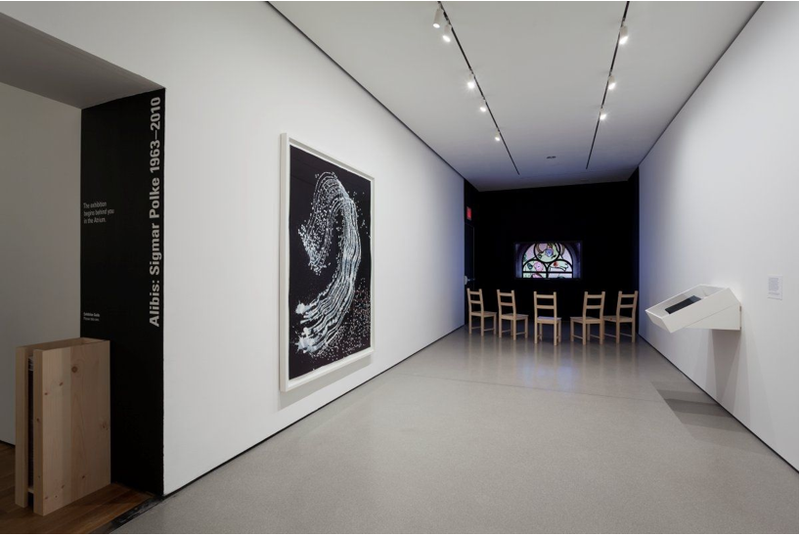 The jewel-like glass window, an abstract depiction of the seven days of creation as written in Genesis, sits like a tombstone at the end of a hall, at the end of the exhibition, laying to rest the enchanting world of Sigmar Polke. 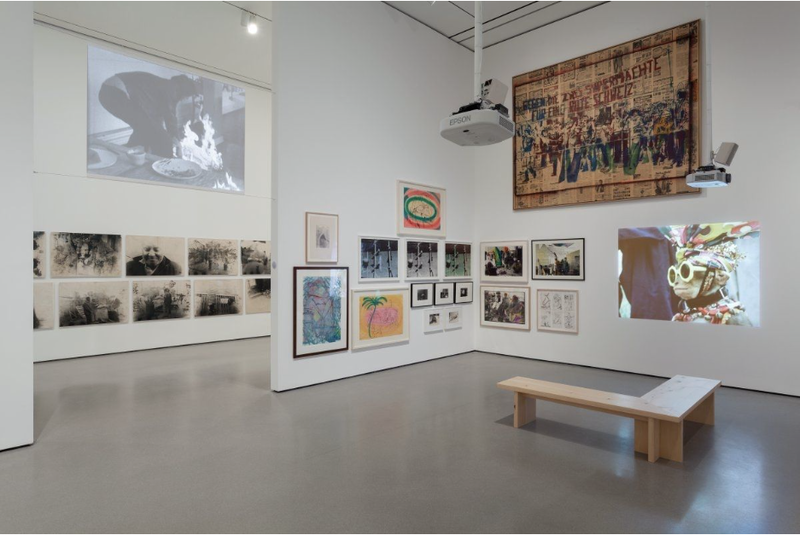 My thoughts here only represent a fraction of what you’ll find in Alibis: Sigmar Polke 1963-2010. I highly recommend you take the trip for yourself. Then we’ll compare notes and see where we land. The retrospective will be on view at MoMA until August 3, 2014.